I don’t understand it. I am almost afraid to confess it, but here it goes. I always cry during baptisms. Literally! I get all watery-eyed every single time. There is something about the powerful picture of a person being plunged into the water to represent the burial of their old life and resurrection of their new life. The powerful baptism t-shirts. The families hugging. The look of victory on the person’s face. I love it. Baptism Sign-Up Form This is designed to help you collect introductory information about people who sign up for baptism. We recommend having a paper form at your Next Steps table and digital forms online. Communication Email Scripts These are designed to help you confirm their upcoming baptism, answer some common questions, provide orientation information, encourage invitation, and provide tools for social sharing. This bundle contains three scripts with a suggested sequence (timeline) to help you communicate before you celebrate. Baptism T-Shirt Files We have come a long way from the traditional baptism robes. T-shirts with powerful messages provide visual reinforcement to the life-changing symbol of baptism. This file includes six different t-shirt designs in both png and psd. We made most of them just one color to help you save on printing costs. Invitation Social Share Posts These are designed to equip people to invite their friends and family to their baptism celebration. We encourage you to attach one of these images to the second email in the sequence. We cannot wait to see what y’all do with this bundle! We would love for you to share pictures with us if you use any of these materials. Reach out if there is any way we can help — custom edits to shirts, advice on implementation of the sequence, or tweaks to the sign-up sheet. It’d be our pleasure to help! 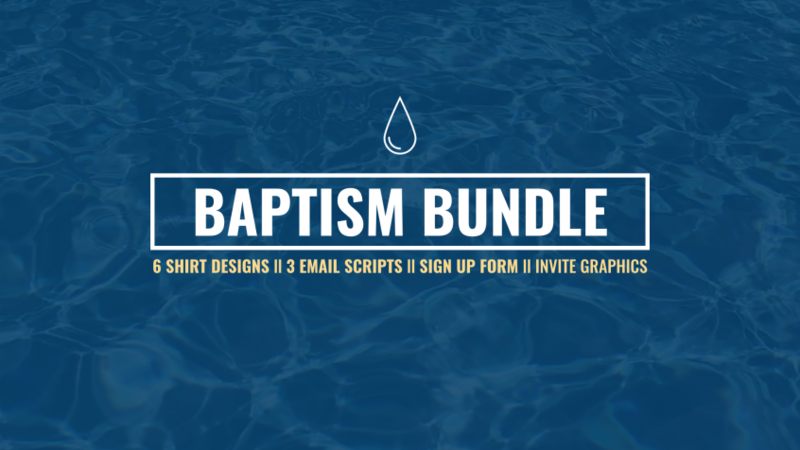 Click here to check out the baptism bundle! VIEW ALL THE FILES HERE!